When it comes to detailing your boat, you will require a boat buffer to work the polish or wax into the hull. Attempting to polish your boat by hand will take a serious amount of time and effort, which is why a polisher for your boat is a great investment. The best boat buffer is the Rupes LHR 21 Big Foot Random Orbital Polisher, which makes working on large boats much easier thanks to a larger orbit for fast cutting. Whether you are preparing your boat for summer or attempting to increase the resale value, polishing it is highly recommended. 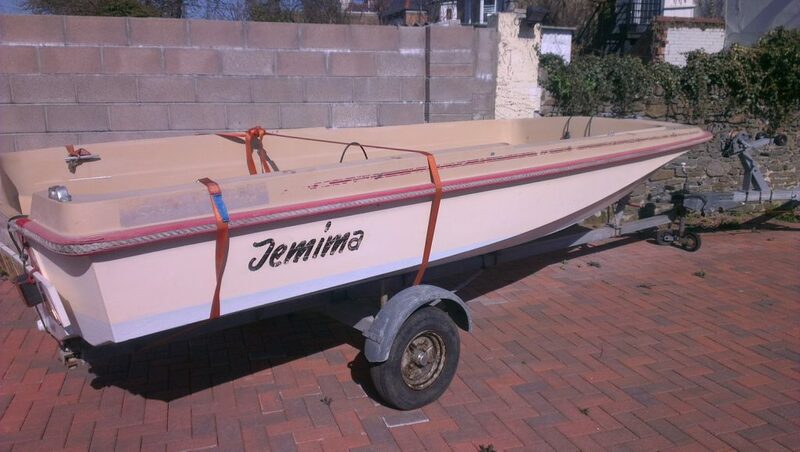 You will need a suitable boat polish and a few hours of your life to bring the fiberglass back to its original form. 8.1 What Else Do I Need To Buffer A Boat? The two main stages of buffing your boat involve using a compound and working it into the gelcoat or fiberglass in order to remove any defects. 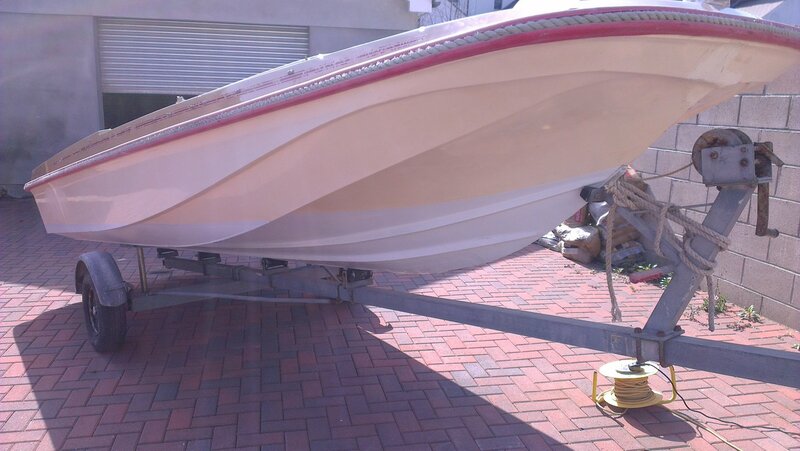 Once complete, you will then want to lock in the shine and protect it with a quality boat wax. If you are a beginner in terms of boat detailing, you will want to be careful of any PVC or decals. The combination of a boat buffer and strong cutting compound will leave a semi-permanent marking or tear the decals, which is something to avoid. Investing into a high quality boat polisher machine is highly recommended, especially if you own a bigger boat. Below is a list of the best boat buffers that will restore your gelcoat or fiberglass hull to its original condition. If budget is not an issue as such and you want the best boat buffer money can buy, the Rupes LHR 21 Big Foot polisher is ideal. The name “Big Foot” may indicate what this boat buffer is all about and it is due to the large 21 mm orbit, which is great for large surfaces such as fiberglass hulls. With the large orbital movements of this buffer, it is perfect for tackling large surfaces. Combined with a quality polishing compound, it will result in a much faster cutting process and a better finish too. It is by far the best boat buffer for detailing large boats but it does come at a cost, which may put of those with a tight budget. The MT300 Model by Meguiar’s is a very popular buffer that is used by both automotive and boat detailers. It has been ergonomically designed to reduce user fatigue, which if you are buffing a large boat, is a big factor to consider. The clever digital torque management is a game changer in terms of boat detailing. It works by automatically adjusting the torque of the buffer to match what is required to maintain the load speed, which will help you buff the surface more easily. Overall, it is the best boat buffer for the money with the backing of one of the leading detailing companies within the industry. The Dewalt DWP849X is one of the most popular boat buffers available and built by the reputable Dewalt brand. It uses a powerful 12 amp motor and an all ball bearing construction for maximum performance and durability. 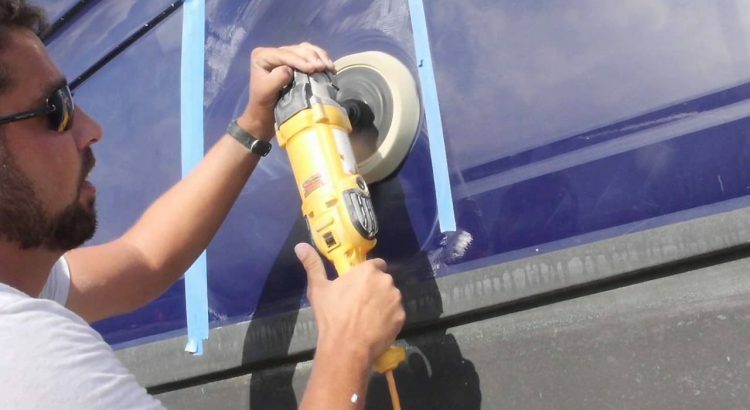 Overall, the Dewalt DWP849X is a great option for buffing fiberglass or gelcoat boats and is relatively cheap when compared to the alternatives. As with all Dewalt products, this buffer has been built to last. Design features such as the wool ingestion shield, ball bearing motor and other components will enhance the longevity of the buffer. The Rupes alternative and even the Megiuar’s MT300 will be out of budget for many boat owners but there is still a premium alternative. Porter Cable is a reputable brand and their random random orbit buffer is highly rated. A great feature which is not found on the others is the fact you are able to adjust the handle to a different position. This is an excellent idea because if you need to polish a certain area, switching the handle to the other side can make things much easier. Overall, it is a great boat buffer for detailing that will certainly restore any fiberglass hull with the correct polish. It lacks a few features compared to the more expensive alternatives but if you are new to polishing, you are very unlikely to purchase the most expensive buffers anyway. The Porter Cable is excellent for beginners and offers great value for money. Griot’s Garage is another big name is the detailing world with a range of buffers available. The 10813STDCRD model is the most popular with the choice of a 10 foot or 25 foot cord where the latter may come in useful for large boats. Overall, it is a great all-rounder for boat detailing that is fairly popular worldwide due to its powerful performance. However, it is on the expensive side of things when compared against the Meguiar’s alternative. For those that want to spend as little as possible but still have a good chance of fixing up their boats dull bodywork, the Wen 10PMC is a great option. It produces 3,200 orbits per minute from a 0.75 amp permanent magnet motor, which is more than enough for working a cutting compound into the boat. Overall, it is a cheap boat buffer with a low power output, which means it will be safe to use by beginners. There is a whole range of cheap knock-offs but WEN is a trusted brand and you can confidently use this boat buffer without causing damage. A dull fiberglass hull of your boat will never look nice and will devalue your boat when you come to sell it. Using a boat buffer and a proper cutting compound, you can get the hull back to it original shiny color in just a few hours and some elbow grease. Long term investment in the correct tools will bring greater rewards further down the line. A buffer is something that you can use on your boat every year if you want and of course on your car or truck to remove any defects. Below are some factors that you should consider before jumping at the first boat buffer you come across. What Else Do I Need To Buffer A Boat? Alongside the boat buffer, there are other tools and products that you will require. The obvious being a cutting compound that will easily cut through the oxidization and other defects to reveal the shiny gel coat. Again, it is worth spending that little extra for the bigger brand that would have spent millions on research and development on everything to do with marine polishes. You will also need a compounding pad and a polishing pad for finishing. 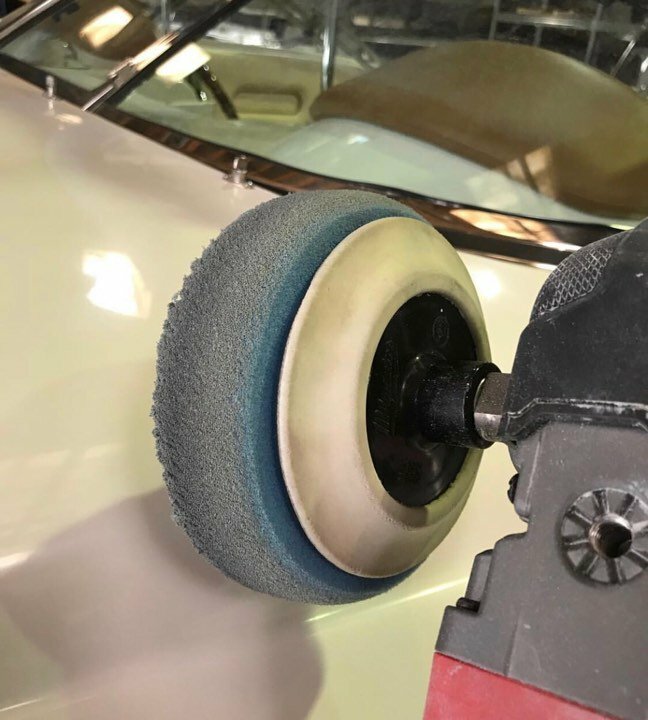 The compound pad is a firmer pad, which makes it easier to cut into the gelcoat compared with softer polishing pads, which is simply for the finer stages of polishing or waxing. For wiping any residue, a number of high quality microfiber towels will be very useful. Once you have everything, you are ready to get to work with your boat buffer. It is very much similar to using a polisher machine for your car. You will need to wash down the boat, remove any dirt clinging onto the buffing space and then dry the surface. It is a very important step to reducing any damage because dirt can get trapped between the buffer and the fiberglass, which will result in scratching. Once the boat is completely dry, you will want to add a small amount of polish to the pad and simply work the polish into the boat. If it is your first time, its advised to start at a low OPM and work your way to the higher speeds once confident. If you are a novice to boat polishing, you may notice you are guilty of some of these mistakes. Luckily, polishing a boat is much more forgiving that polishing a car, which can leave marring marks and other defects when not done correctly. Get your boat back in tip top condition by polishing it using a boat buffer. It may take a few hours and purchasing the polisher machine may cost a lot of money but its a worthwhile investment that will add value to your boat. As with any tool, the more you spend, the better features and gadgets you will have to play around with. The Meguiars MT300 and Rupes boat buffers are highly recommended in order to get the best finish to your boats fiberglass hull.